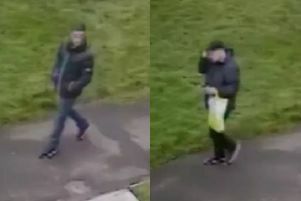 Police have launched a hunt for a BMW estate car after reports that men inside it were seen putting on balaclavas as a security van collected money. The alarm was raised by members of the public at around 5pm Saturday, August 5, after the men - possibly armed, say police - were spotted outside the B&M store in Woodneuk Road, Nitshill. The driver of the blue BMW 3 series estate car, which had tinted rear windows, is described as Asian and aged around 50. He had short dark hair, a moustache, and had facial acne scars. Two male rear seat passengers are described as Asian men in their 20s. Detective Constable Stephen Greenshields of the Community Investigation Unit is asking anyone with information regarding this vehicle to contact his office at Helen Street Police Office through 101.